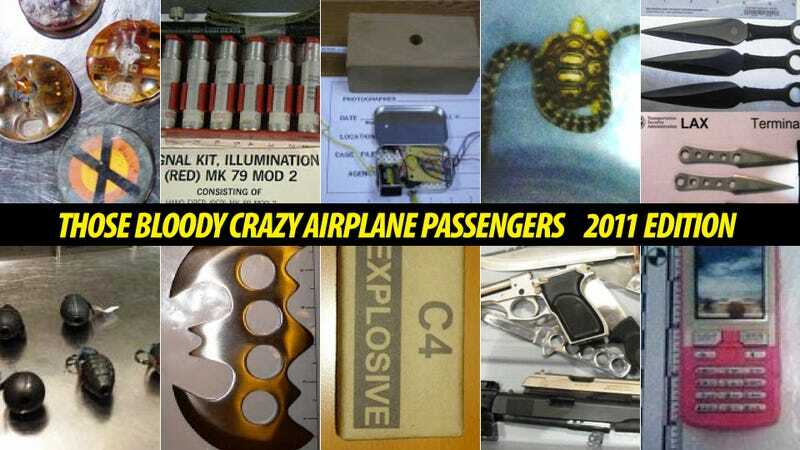 The Transportation Security Administration has released a list of the worst/best/most crazy things caught by their airport agents in 2011—including a whooping 1,200 loaded firearms. I picked my favorite top ten because theirs is not right. A passenger tried to sneak 240 live fish inside four hard suitcases filled with water at the Los Angeles International Airport. The explosive detection system got itchy and the scanner image showed the fishes. After opening, the agents discovered the fish "packed like sardines", in all shapes and colors, trying to swim. Some Bat-imbecile tried to pass through San Antonio's airport security carrying this pseudo-Batman knife. A college student tried to pass his science project that had plenty of cable and a mint tin through Omaha's airport detectors. The agents saw it through the X-ray machine and instantly thought it was a homemade bomb. Indeed, it looks like a homemade bomb even looking at it out of the luggage. The TSA usually catches all sorts of knives and blades, including some martial weapons not made of metal, like these two sets of throwing knives (left) caught in Los Angeles and San Diego. On the right you can see two knives neatly packed inside the chapter 2 of a book titled: Ninja: The Shadow Warrior. Apparently, fake ninjas are pretty dumb. More LAX nutters: a passenger tried to sneak a fake pink cellphone that was actually a stun gun. The passenger surrenderer the cellphone and was able to continue the flight, but this is the kind of thing that can result on an actual arrest. A passenger going through Norfolk's airport was carrying this signal kit, illumination (red) mk 79 mod 2: a flare gun with seven flares ready to be launched. Some idiots still insist in passing birds, turtles and other live animals through security. This can get you a fine (I'd personally like to cockpunch them). A guy in Miami International Airport tried to sneak seven small snakes inside his pants along with three small turtles. They were all inside women stockings, as shown in the image on the lower right. Five grenades, all inert, were found in a passenger checked luggage at Newark, which instantly fired up the alerts. Meanwhile, at the good old LAX, a passenger was carrying a spent smoke grenade in their carry-on bag. This clown was flying from Salt Lake City International Airport with four bloody landmines in his checked bag. All the alarms went off but. when the explosives squad arrived to the baggage processing facility and determined they were inert. As a result, all the bags in that area had to be rerouted and four flights were delayed. A man flying from Yuma International Airport was arrested after the TSA found one half of C4 explosive concealed in a tobacco can using an Explosive Trace Detection system. Seriously people, are you out of your f*cking mind? A guy was going through Newport News Williamsburg International Airport when the TSA agents discovered a gold ingot with $10,000,000 stamped on it. The gold was fake but, as it turns out, the guy was a fugitive who was arrested on the spot. Note to any criminals reading Gizmodo: if you are a fugitive, it's a good idea to avoid going through airports carrying things that would get you searched.